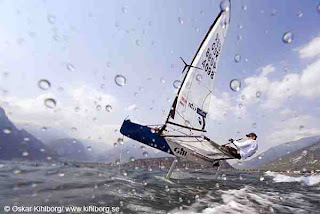 There are a load of Oskar Kihlborg's photos in the Yachts and Yachting Worlds write up. 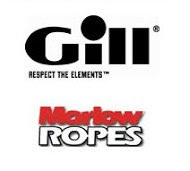 Thanks to Colin Newman for seding one in! The class has so much publicity that it is easy to forget the traditional event report for the magazines! I've got two good pics in the article. My flying leap - that nobody believes was intentional! and a great blurred flyby shot. I think I'll get a copy of that from Oskar for my front room. Moths make the front page again! 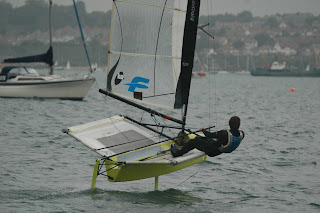 The Nationals has only just finished but there was still Moth sailing going on in Weymouth on Saturday. I sat on the pontoon next to 'Payne's Post' with a camera. I've perfected the bottle grab, the nose dive gybe, and the flying leap! We might have to have a stunts evening during the Worlds! Please do not attempt these stunts without sufficient Moth experience and a video camera aimed at you! It was a busy week, so I'll try and catch up with some posts here soon. 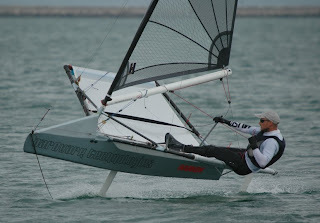 It was a good event, and I'm just about sorted in the new boat now finishing second behind Jason Belben overall. I got back from Garda late on Friday night, had a busy day on Sat unpacking, then a chilled Sunday where I went over to Portland to catch up with the Mothies who were heading out for a sail. It was trying to rain but I got a load of good piccies. 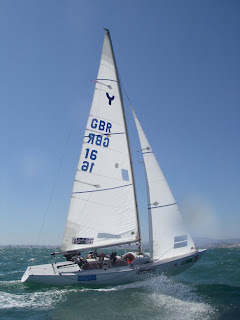 Victoria, Emma and Sue had a great end to the regatta in Cascais, with a 2nd in the last full fleet race pulling them up from 16th to 10th overall and thus making the double points final day medal race. 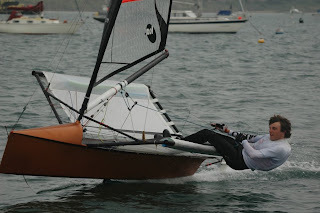 Then they finished the medal race in 4th which was enough to get them 9th overall. I've been keen for a while to launch a page on the UK Moth website to promote possible research projects relating to the Moth class. There are so many interesting research ideas, and I'm sure many Moth sailors would be keen to support these projects with background info, and any help with testing... Watch this space for a more official launch soon. 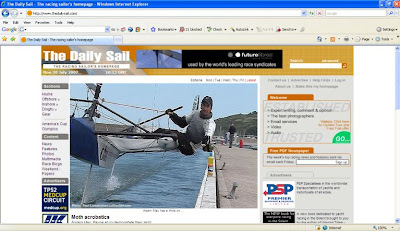 On that theme there is a project running at the Hamburg University of Technology called “User Innovation in Sailing". The Moth Class is being used as an example in this. 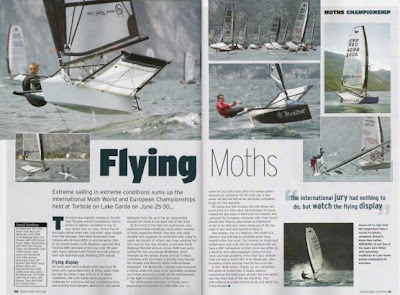 A summary of the project will be available to the International Moth Class. 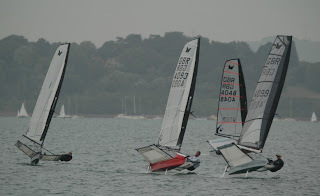 Races 5 and 6 were on the ‘offshore’ course 5 today, and it was quite a spectacle! 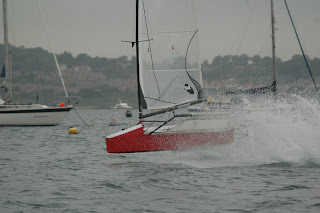 Over 30 knots makes for very exciting Yngling racing! They must have been doing 10 knots, which is impressive for a water pushing Yngling. Victoria, Sue and Emma who I’m coaching out here had a great race and sailed through the fleet to finish 2nd. 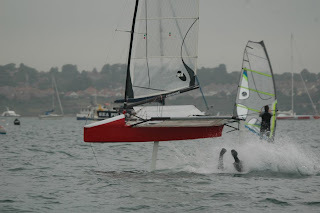 Really solid boat handling and pace downwind in the breeze saw them sailing around many of the fallen fleet. 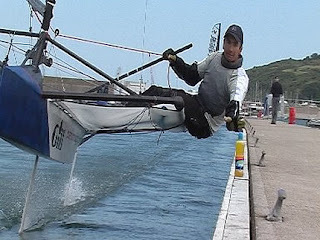 Straight after the Moth Worlds, I drove down to Milan and jumped on a plane to Lisbon, where I am coaching just down the coast in Cascais at the 2007 World Sailing Championships. I’m down here working with the Yngling development squad of Victoria Rawlinson, Emma Rawlinson & Sue Monson. 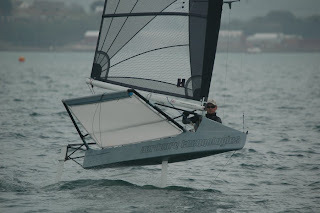 We’ve had a bit of time on the water, got through measurement, and start racing on Thursday. The Skandia Team GBR squad is here in force with 99 sailors down here apparently! 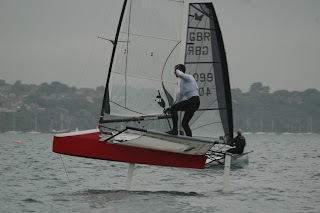 Although not a great result it was a very enjoyable Worlds in Garda. 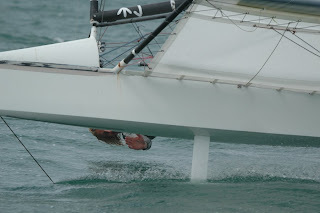 8th overall reflected my lack of preparation, and launching of the new boat just days before the event. Having had such a busy year it was nice to just be sailing again though, and although I did more pitchpoling than ever before, I’ve just about got the new boat sorted and learnt a lot more about these flying craft again. Particularly enjoyable was the atmosphere in the British team this year. 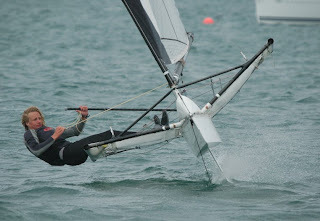 We had a great bunch out in Garda, and I look forward to catching up with everyone at the Nationals. 1. Rohan Veal. 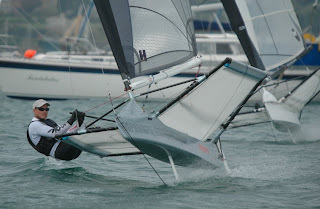 - On top of his game after a lot of training and time on the water this year. 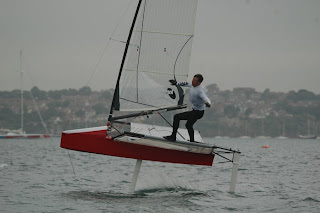 Original reports of Bladerider pace suggested it could be close, but in the breezy conditions and tricky waves experienced in Torbole, the boat had pace and a level of control no other package could match. 2. Scott Babbage – A very solid series using Bladerider pace and control to good effect. 3. 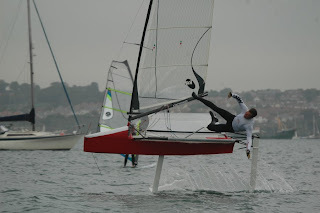 Simon Payne – On the back foot after loosing his gantry/transom on day one. 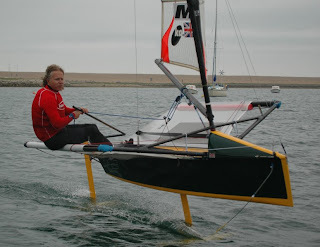 He never had the upwind pace or control downwind in the breeze to match the Bladeriders in full flight. He did win the lightest race of the series though, so it would have been interesting to se some more races in different conditions. 4. Sam Pascoe – A great result for Sam. Always tipped for a good series if it was windy. Good pace with the new Full Force main foil, but possibly a few too many swims and the odd average start cost him a possible podium. 5. 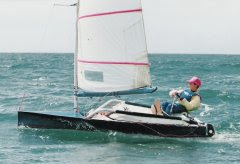 Graham Vials – An early Bladerider preproduction boat slowly fell apart around him. 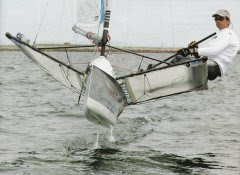 Leaks and wand issues during the regatta after a host of problems before the regatta ended with a hull deck joint failure in the final race that could have cost him forth overall. 6. 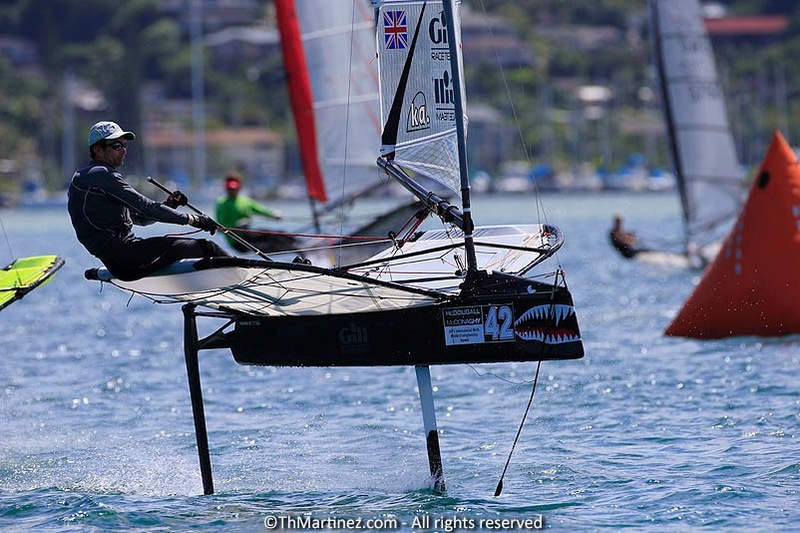 Amac – A snapped foil, lost main flap, and a few other boat issues upset his series. He sailed really well though, and certainly deserves all the credit for the pace of the Bladerider package. 9. 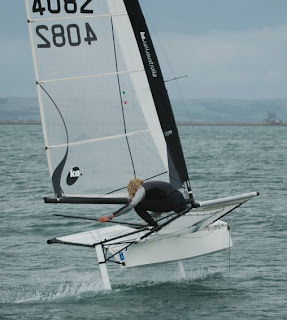 John Harris – A top result for a relatively new foiler. 10. 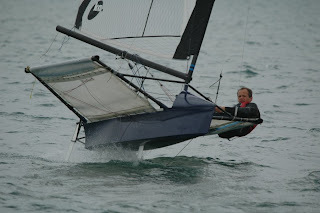 Les Thorpe – Solid sailing in the breeze early in the week, probably sailing close to the limit of his boat and foil package.